Ask fellow campers about "Quality RV Park" and nearby attractions. Question: Is there long term rentals and if so,how much? Stayed here overnight. Good basic amenities. Good value for the money. Park caters to the long term visitors and has a number of older rigs but space for the short termer also. I'd stay here again under the same circumstances. We camped at Quality RV Park in a Fifth Wheel. Camped 3 nights while visiting son stationed at Fort Polk. Easy to get to. Seems designed mostly for extended stay. There is no office, and we never met any staff. After we left, we called and asked for the mailing address to send payment. I believe they have Wi-Fi, but I never met anyone to get access. There is a building with washers/dryers, and restrooms. Restrooms were undergoing some work, so not the cleanest. Overall not a bad experience, but different than most parks. We camped at Quality RV Park in a Fifth Wheel. We found this park by accident. We were looking for an RV Park close to Fort Polk and happened on this one by accident. It is right outside (approximate 2 1/2 miles) from the gate off of LA 467. About 7 miles from the town of Leesville. The price given is based on the weekly fee of $85. This is so convenient to the post. The campsites are gravel with full hook-ups including cable. Their Wi-Fi is fast and free. Also while we were there they were putting in brand new restrooms and a laundry. Would definitely stay here again and would recommend it to all. Very friendly owner and quite helpful. We camped at Quality RV Park in a Travel Trailer. 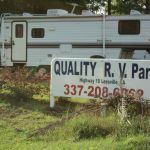 Are you affiliated with Quality RV Park ?